UXBRIDGE, U.K., Sept. 9, 2014 – With mobility, security, cloud access and productivity on the minds of today’s workforce, Xerox has introduced new functionalities, apps and products for its ConnectKey® 1.5 software and technology. The latest enhancements include four new multifunction printers (MFPs) – including two A4/letter-sized devices – and software apps that push the boundaries of traditional device functionality. WorkCentre 6655 Colour A4 MFP: 60-sheet duplex automatic document feeder; maximum capacity of 1,250 total sheets; prints up to 36 pages per minute (ppm) in colour and black-and-white, with easy to use touch screen. WorkCentre 3655 Monochrome A4 MFP: Up to 47 ppm with a maximum capacity of 2,350 total sheets; large touch screen simplifies use. WorkCentre 7970 Colour A3 MFP: Prints up to 70 ppm in colour and black-and-white with option for C and Z folding capabilities; enhanced productivity and flexibility in app creation. WorkCentre 5945/5955 Monochrome A3 MFP: New clean-sheet design offering sharp image quality made possible with LED technology and Emulsion Aggregation toner; the device prints from 45 ppm up to 55 ppm. Xerox’s Extensible Interface Platform 3.0 enhances the capabilities of these ConnectKey devices with tools such as WebKit browser support – making it easier for Xerox partners to develop the control panel user interface for their apps on their customers’ MFPs. Additionally, with the launch of the Xerox App Studio 2.0, new ConnectKey apps give users direct access to emerging hosted cloud solutions such as Microsoft Office 365 and Dropbox by scanning to, or printing from these repositories. There’s also an app that lets customers print from their own URL – whether behind a firewall or in the cloud – creating a convenient, easy-to-use “print-on-demand” environment. Xerox Secure Access Version 5.0, a print management solution, is now a modular, software-only solution allowing customers to use authentication features at a lower cost, with the ability to blend easily with industry standard card readers. New features to Xerox Mobile Print Solution 3.0 offer more convenience, increased security and greater flexibility in job submission. These include the ability to choose media sizes and select page ranges for printing. The solution is easy to install, manage and support. Xerox was recently recognised by Buyers Laboratory LLC (BLI) for its exceptional portfolio of document imaging software and solutions and presented the “2014 Document Imaging Solutions Line of the Year” award. Organisations using Xerox’s managed print services to reduce costs and operate more efficiently find ConnectKey’s capabilities an added bonus as they strive to harness their information. For example, the A4 MFPs respond to customer needs for smaller, lower cost devices that maintain network access and solution compatibility. The new ConnectKey-enabled MFPs, Xerox App Studio 2.0, ConnectKey apps and Xerox Mobile Print Solution 3.0 are available for ordering immediately in most geographies. Xerox Secure Access Version 5.0 will be available in most geographies in October. 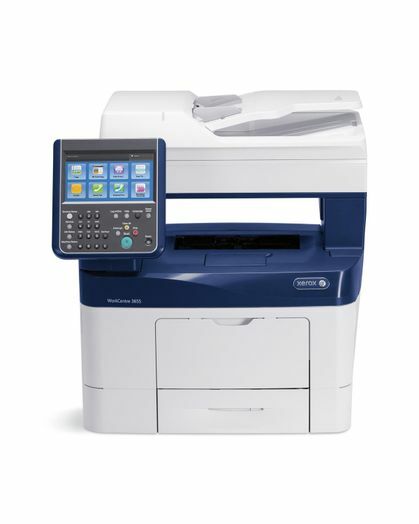 The new WorkCentre 3655 Monochrome A4 MFP has a large touch screen to simplify use.